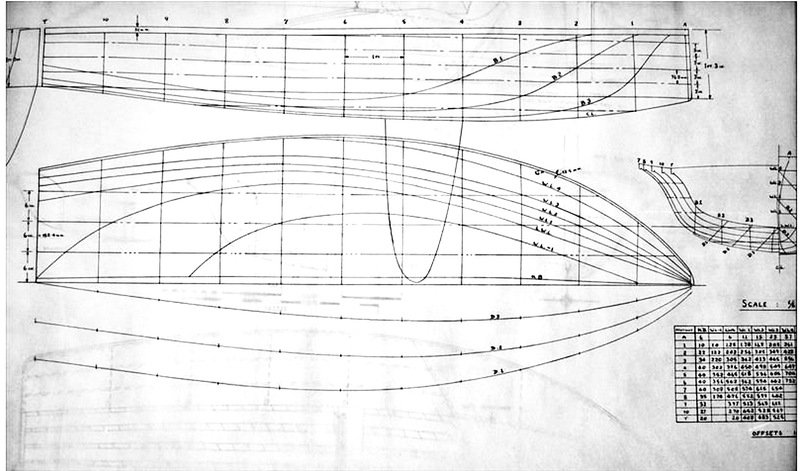 The previous header photo is the side-view that John Shelley, ex-pat Kiwi dinghy designer working in England, drew of one of his Moth designs (he had three variations) for a patent he was awarded for tortured ply construction. (There is no indication he ever exercised the patent.) In one of those what-if's, I've always wondered what would have happened if it had been the Shelley Moth that had exploded in Europe, instead of the Europa design, and it was the Shelley Moth that became the Womens Olympic Singlehander. The Shelley is a good example of the 1960's Australian/New Zealand plywood, single-chine dinghy and I've always felt that this design had a little more upside in heavy air performance compared to the Europe Dinghy. Blog on a home build Shelley Moth over here. The men who would be boys (or at least those Aussie blokes who at one point designed, built and raced the Australian Sailfish) emailed me to announce that they have set up a website (in development), all about the Australian Sailfish . I'm looking forward to see what they dig up about this very simple, very quick, very interesting Australian singlehander. Click here to check out their website about the Australian Sailfish. Earwigoagin posts about the Australian Sailfish here, here, and here. Two new one-design singlehanders pushing the performance envelope were seen at the 2016 Sailboat Show. 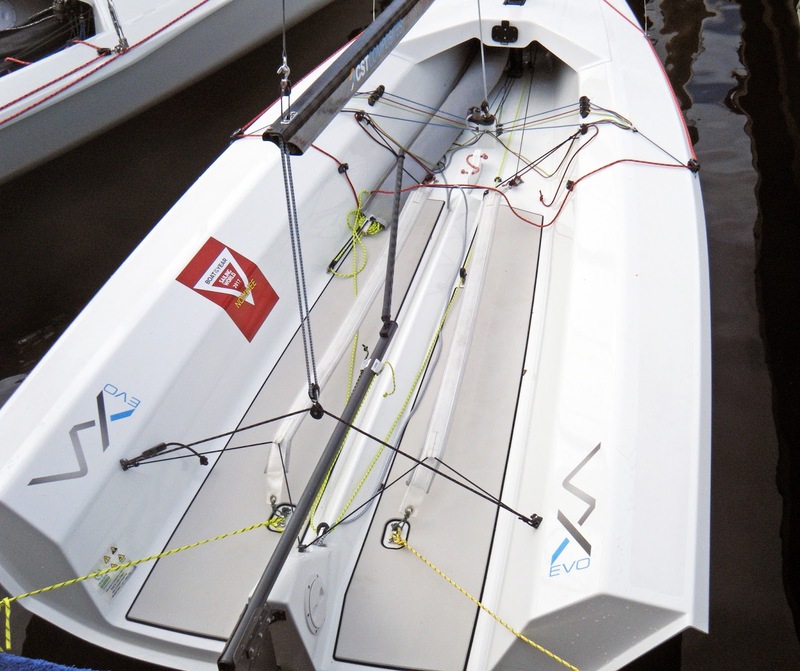 The VX-Evo is designer Brian Bennet's addition to the long list of assymetric spinnaker singlehanders (the MX-Ray, the Devoti D-One, the RS 100, the Weta trimaran - have I left anyone out?). It is a big singlehander, 4.77 meters long, 1.7 meters beam with a big rig, approx 10 sq. meter main and a spinnaker about the same size. The VX-Evo seems designed for big Americans but the salesman also metioned that there were some couples interested in buying the boat and sailing two-up. The VX-Evo is built by Ovington in England. As of the boat show there were definite plans to ship three containers to the U.S. for a total of 24 boats to jump-start the class. I just got a chance to look down into the VX-Evo cockpit but you can see the wedge hull with max beam and chine continuing well aft for power. Price complete is $14 K USD. Video of the prototype being put through the paces. Interestingly there is no forestay (which allows the spinnaker to pop through on gybes) but there are sidestays. The Waszp was sitting inside the Ronstan tent, surrounded by a crowd. I was able to poke my camera through to take a quick photo from the transom. The designer was busy talking to a rep from the U.S sailing magazine, Sailing World, as the Waszp is up for that mag's Boat of the Year Award - hence I didn't get to ask any questions. Most present-day development of foiling seems to be on the catamaran platform. It will be interesting to see if this low cost Moth can bump up the popularity of foiling in the small singlehanded sector. 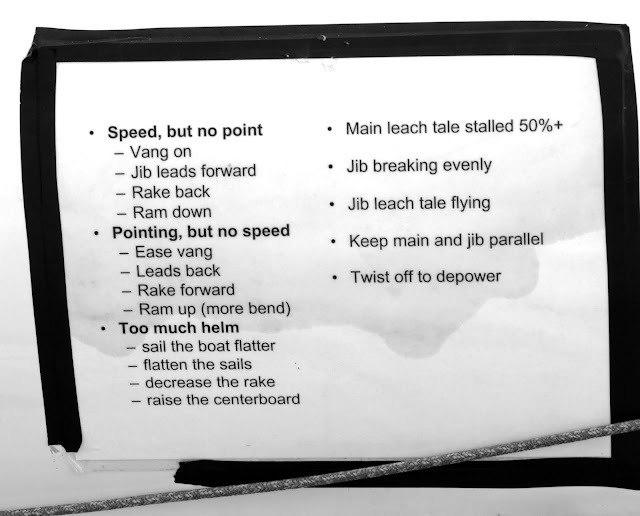 Certainly from watching the videos the foiling performance of the Waszp seems very much Moth-like. Note the wishbone boom. I gather the angle of the wings can be altered to make it feel safer for a beginner. There are also various sail sizes offered. WASZP in Japan from Hiroki Goto on Vimeo. Music Whenever: Empire of the Sun "High and Low"
Some of the visuals of this music video have the Salvador Dali, trippy, psychedelic look of the album covers from the 1960's and 1970's. Way cool. We also have the psychedelic interspersed with a hippie troupe gallivanting through nature... so definitely a throwback. However, the music is modern, dance club electronica. High and Low - Empire of the Sun - Director's Cut from Roof Studio on Vimeo. I made it over to the U.S Sailboat Show last weekend. I took some photos with my older waterproof camera (my newer one died) which I'll post at some point. If you want photos now, go over to fellow Classic Mothie, George A's blog where he has put up a slew of photos of the Show. 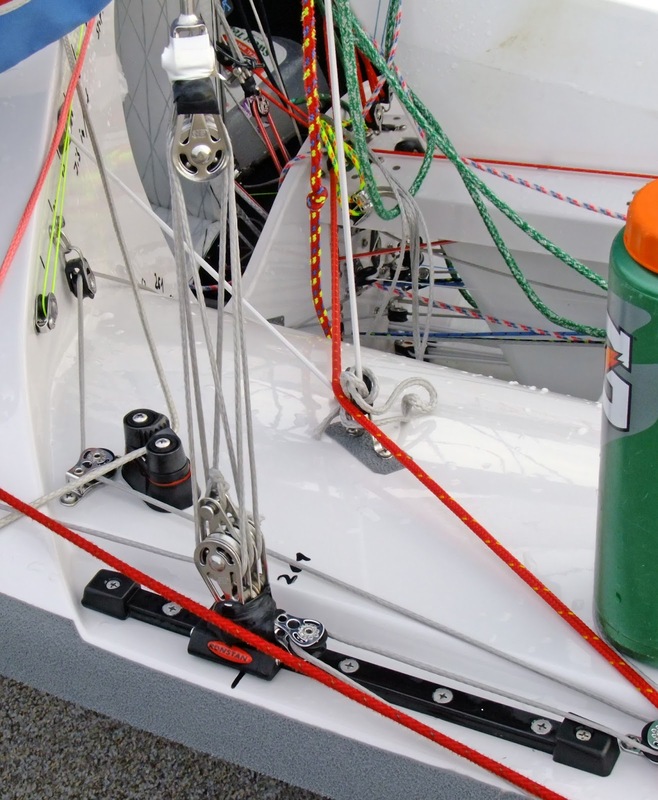 Melges 14 - (Previous posts here, here and here.) Around one hundred Melges 14's have been built with about half of them going overseas (interest is strong in Germany and Italy). Nearly all of the U.S Melges 14's are in the Midwest, the backyard of Melges Boatworks. There was no racing schedule this past year but the class did hold their first regatta at Lake Max, Culver, Indiana this past weekend. (Video from the class Facebook page.) My feeling, in talking with the Melges salesman, is they are angling the Melges 14 towards a more general purpose crowd, particularly with their large cockpit (though the 14 is certainly racy enough.) For a mid-winters, there is some thought at piggy-backing a Melges 14 regatta off a Melges 24 regatta in Florida. RS Aero - (Previous posts here and here.) I hadn't realized that Zim Sailing had become the East Coast rep for RS Sailing (evidently this happened last year just after the Show) and the RS boats were featured on the Zim Sailing stand at this year's show. The RS Aero is a clear leader in quantity, hundreds have been built (I forgot to ask for a specific number), there is a strong presence in Europe and the RS Aero can be found in ones and twos in most areas of the U.S. (but surprising, no activity yet in the Annapolis area). The big concentrations of RS Aero activity in the U.S. are the Pacific Northwest and the Northeast where there are some nasceant fleets and organized racing. 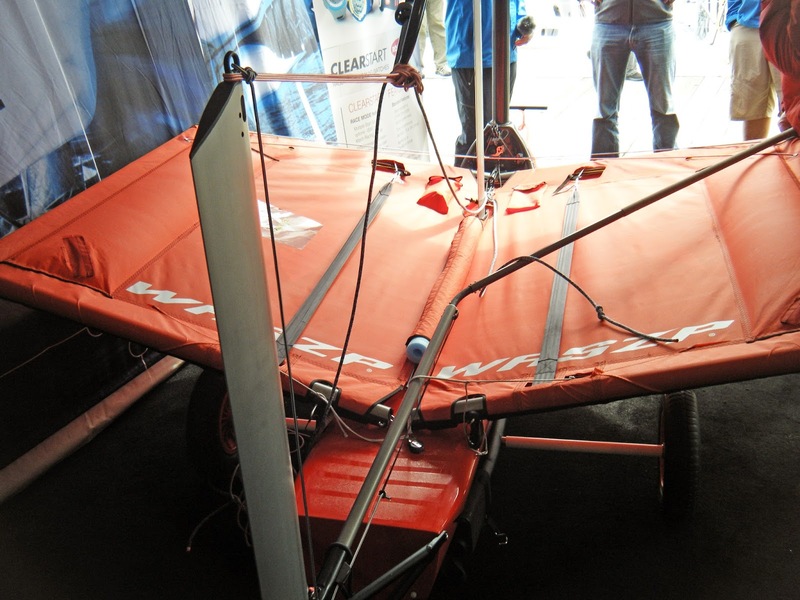 For more detail on RS Aero activity, there is no better place on the InterWebs than to click over to Tillerman's blog. There you have it; the RS Aero is gaining a foothold in the Pacific Northwest and the Northeast, the Melges 14 is percolating in the Midwest. If you were taking a round-about tour of the U.S., you would more likely bump into an RS Aero than a Melges 14. (But a RS Aero or a Melges 14 sighting would still remain very rare, as it remains true today, nearly every yacht club in the U.S. has some number of Lasers kicking around the dinghy park.) Unlike the Laser, which exploded on the U.S dinghy scene in the 1970's, given the factors at work in 2016, I would expect these new singlehanders to chart a more gradual acceptance into the sailing scene. Addendum October 20, 2016: Tillerman left a comment indicating I am under-reporting the numbers and activity of RS Aero sailing in the U.S. I've moved his comment over to the main post. "Thanks for the update on the RS Aero and the plug for my blog. "I believe over a thousand RS Aeros have been sold worldwide, and the biggest countries by sales are UK, US and Germany in that order. About 150 have been sold in the US. In the first year, boats were sold in 39 countries on 4 continents - not sure of the latest numbers. "You are correct that there are active RS Aero fleets in the Northeast and Pacific Northwest. There are also fleets in southern California, Florida and Texas. The RS Aero scene in Texas is really heating up with 14 RS Aeros already registered for the Wurstfest Regatta next month. 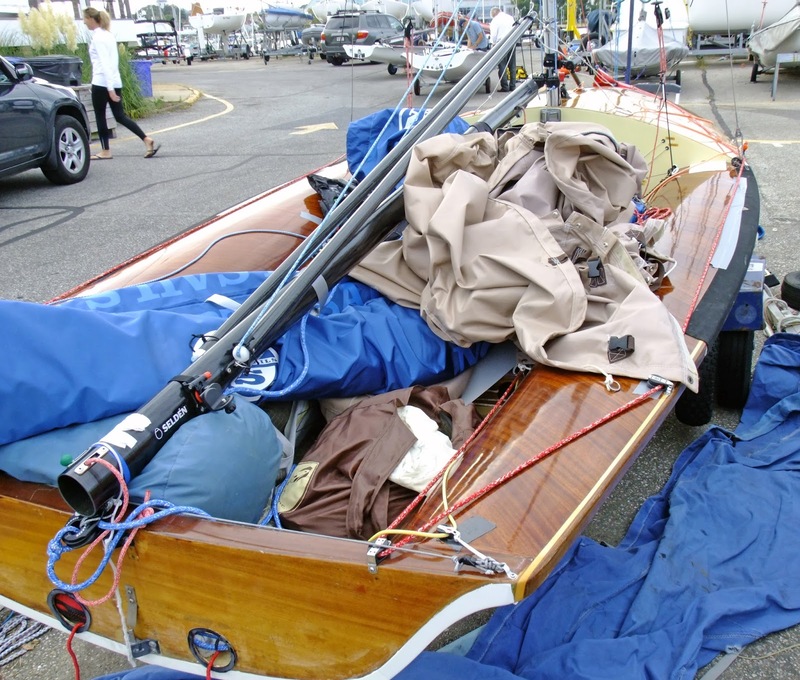 There were 4 RS Aero regattas in New England this year with 16 and 17 boats at a couple of them. And there were 35 RS Aeros at the US Nationals at the Columbia River Gorge this year. "There will definitely be two RS Aero regattas on back-to-back weekends in Florida this winter, and early indications are that attendance will be in the 20s at least. "The RS Aero has World Sailing international class status now and the first RS Aero Worlds will be at Carnac in France next year. 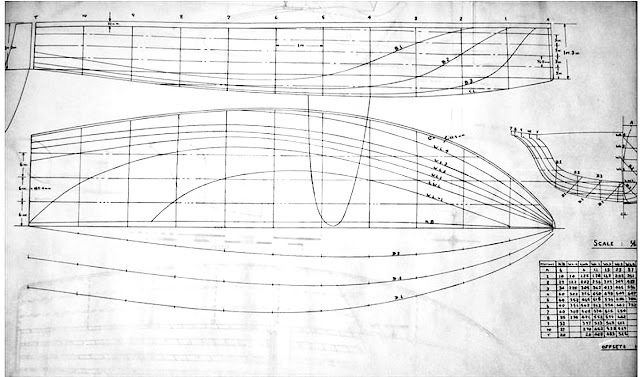 I initially thought this design would not have met the 1 inch (25mm) hollow rule the class had in the 1960's (and a rule that our modern Classic Moth class still retains) but on second look it seems that John Westell did meet the rule (the rule applies aft of the daggerboard trunk and John did reduce the gunwhale flare to what looks to be legal limits in the back of this Moth). Speed-wise this design does not offer any advantages to our current Gen 1 race-horses (the Shelley, the Europe, the Cates) but for someone who wanted to build a lovely mini-505 and race Classic Moths, this would be a very interesting and welcome addition to our polyglot group. 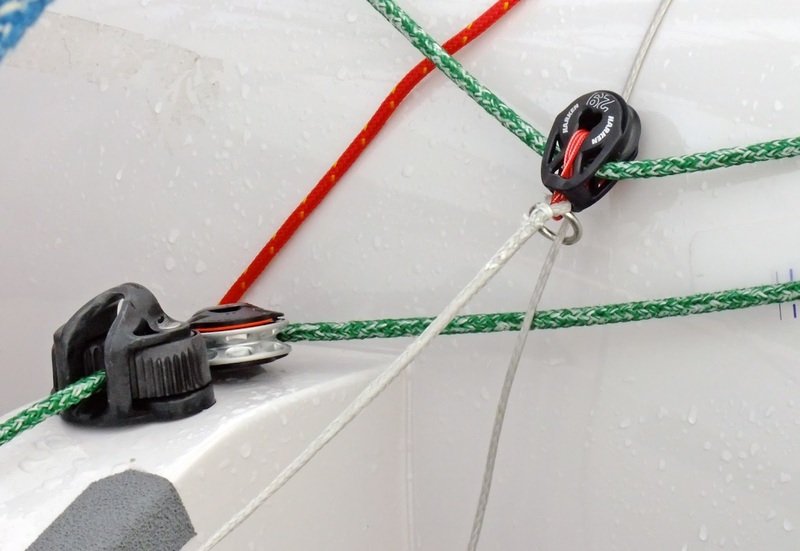 I was reminiscing in a email exchange with Kiwi Neil Kennedy about the string puller classes; those dinghy classes that seem to have a mind-bending assortment of rope controls to tweak everything. The old Olympic double-hander, the Flying Dutchman comes to mind as good example. 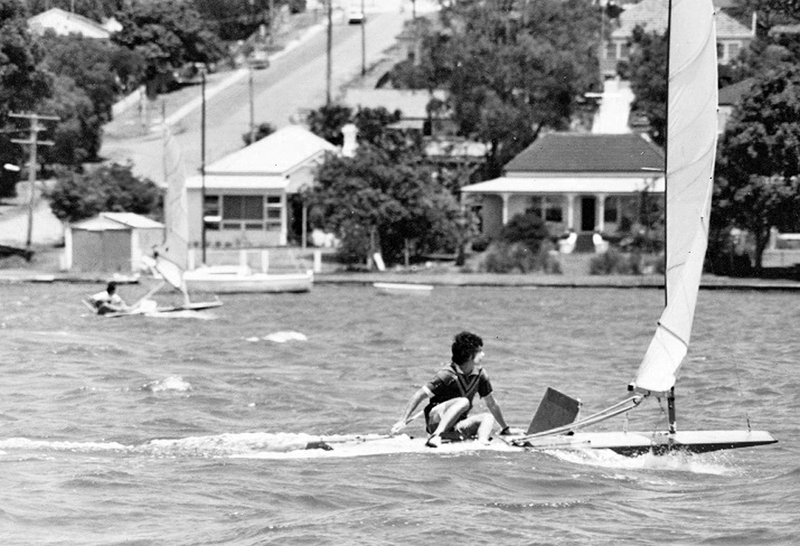 These dinghy classes were more prevalent in the 1960's and 1970's and also can be found in the modern sailing world in other dinghy cultures, such as the English... not so much in the United States... except for the always interesting 505 class. I closed the email saying the 505's were coming to town for their East Coast Championships in September and I would try to get some photos of "string". I was able to wander around the SSA dinghy park before the event started and did get some photos. Many of these systems photographed below I saw on the old International 14's of the 1970's and 1980's. However, on the modern 505 they have been refined to the Nth degree, using modern materials so they work flawlessly. This 505 had a condensed user manual electrical-taped on the aft starboard seat tank. I asked the crew about it and he said it was from the previous owner - they didn't abide by the instructions but kept it around anyway. This 505 dispensed with the jib tracks on the inside of the tank and replaced it with a floating jib lead adjustment using thin spectra line (possibly to bring the lead further inboard - I didn't ask). The ultimate. Supposedly a German dinghy fitter takes a bare Rondar 505 shell and this is what you get back. Note the hoop center main on a traveler. This allows weather sheeting of the main when you really want to twist off the top leach without having the rest of the leech sag off too far. 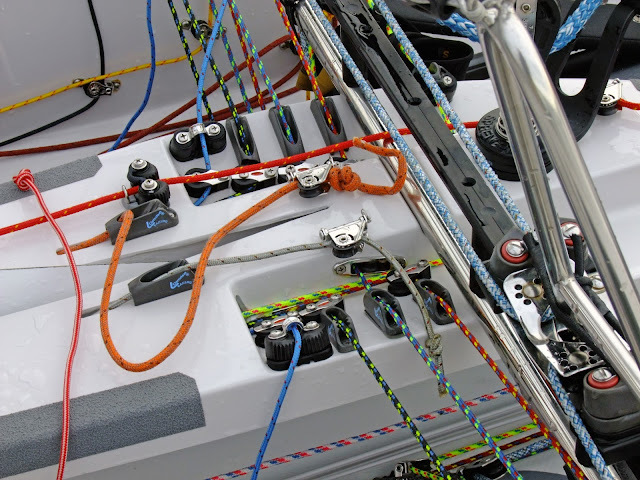 One other advantage of such complexity in the middle of the boat; you can concentrate more weight in the center and get around the corrector rules. An older 505. You can tell it has been much modified by the multiple filled screw holes on the centerboard cap. 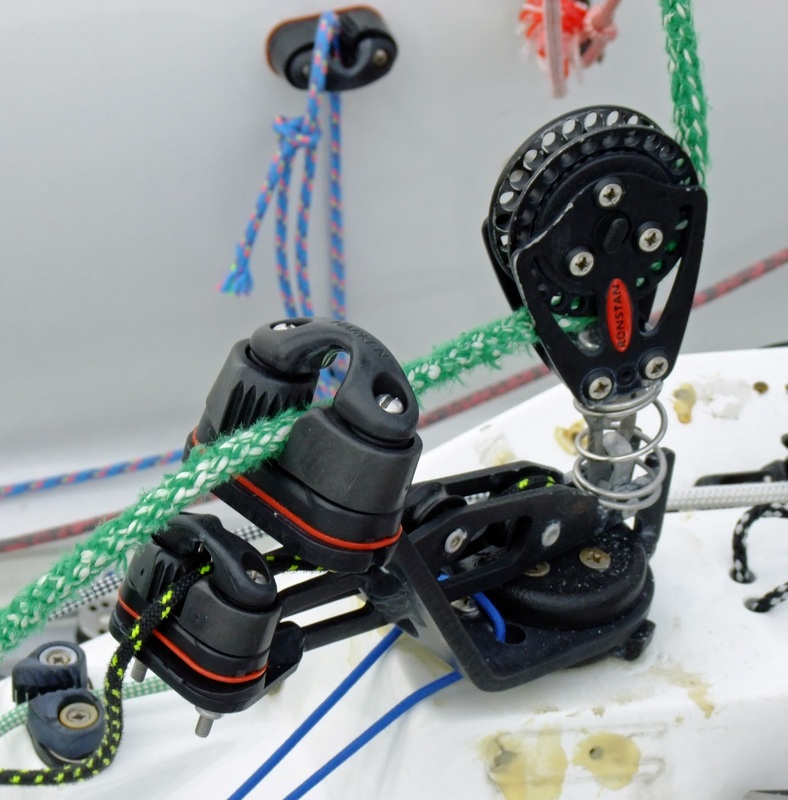 This is an over-under mainsheet/vang control/cleat (mainsheet on the top, vang on the bottom). The German fitted 505 didn't use a mast ram at the gooseneck. Pre-bend of the mast was controlled by moving the shrouds fore and aft on a shroud track. The 505 mast rake can be adjusted throughout the race. 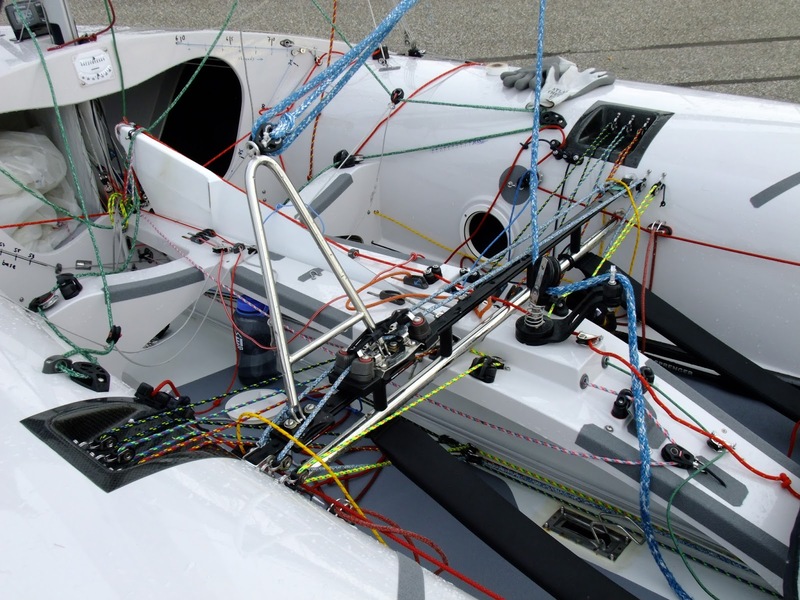 With this set-up, the multi-purchase system used to tension the shrouds is out in the open and not buried inside the mast ring frame. Usually shroud tension on these dinghies requires something like a 36-1 purchase system. The control console on the German 505. I didn't ask about specific functions of each string shown. The modern 505 has twin spinnaker poles, slung on each side of the boom. This allows the crew to jibe the spinnaker without ever having to clip the spinnaker pole onto the mast or the spinnaker guy onto the pole - everything is done by pulling a string. 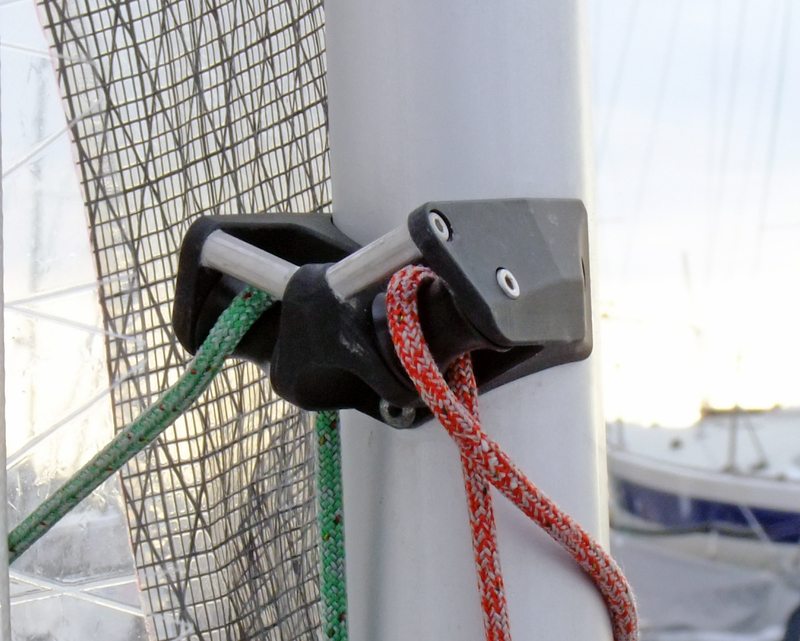 This is the custom twin pole fitting on the mast. Twin carbon spinnaker poles on a 505 where the boom is not yet placed on the gooseneck. When the pole is launched the spinnaker guy is automatically sucked up into the pole. There are still very competitive wood-decked Lindsay 505's from the 1980's, albeit fully upgraded with the modern kit. 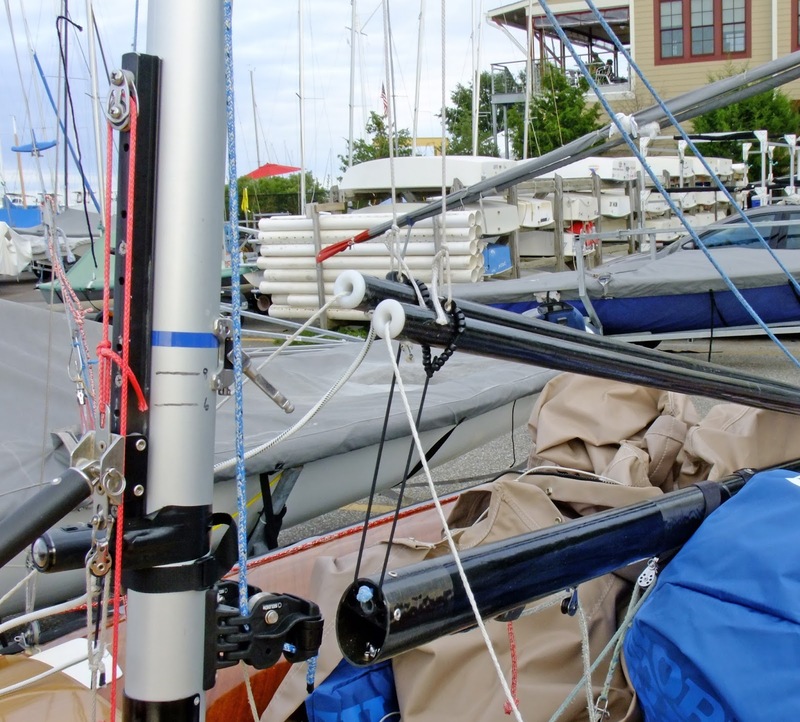 The class now allows carbon booms but still requires an aluminum mast. Some other posts featuring the 505 from the Earwigoagin memory bank. I've featured the Bermuda Fitted Dinghy several times in previous Earwigoagin posts. From observing the photos of Fitted Dinghies racing there seems to be two odd traditions concerning the spinnaker; one of the crew holds the spinnaker pole against the mast (no pole fitting), and the pole is thrown overboard when reaching the leeward mark.